The range of these systems allows comprehensive cleaning for all types of mechanical components even those with complex shapes, blind holes, and cavities. Items to be treated are placed in stainless steel net containers of various sizes, or in a special “shuttle” tailored according to the shape of the item to be treated. Possibility to choose the type of cycle treatment, alternating or continuous (360°), swinging or static for fragile items. Spraying ramps and nozzles, can rotate independently at 360°, enabling excellent cleaning results. CM series machines with axial basket rotation are manufactured using the finest high quality raw materials. 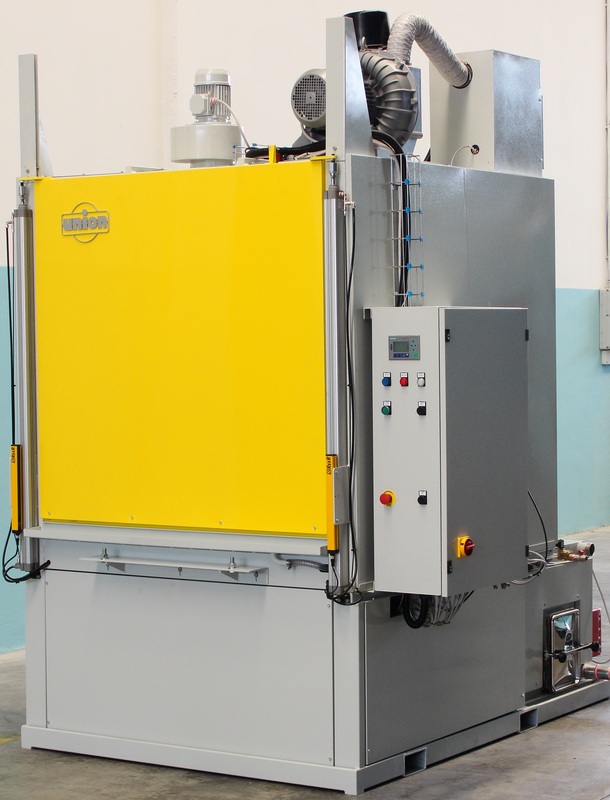 These machines allow the treatment of large size heavy mechanical components. The innovative modular design offers the chance to easily customise the machines and the cleaning process for non-standard applications. The equipment is easy to install and does not require any special maintenance. 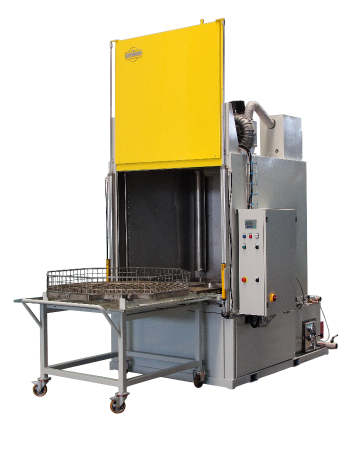 Continuous cleaning systems suitable for treating simple components with a medium to high production time. Items can be placed directly onto the conveyor belt by automatic feed, or manually by the operator. The components pass automatically through the different tunnel stages. 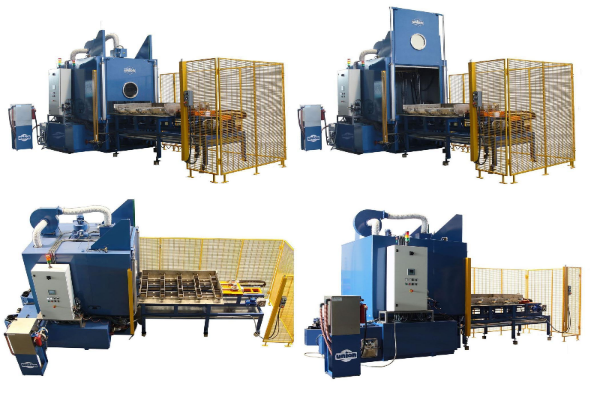 The cleaning process is designed according to the customer’s needs: single bath for inter-operational degreasing phases, or a multistage bath for special finishing treatment or phosphate pre-painting treatment. Similar in construction to the standard tunnel, the items to be treated go through the different stages step by step. With this configuration it is possible by means of special washing tools, to clean even complex items. During the pause between steps, a special spray jet can clean any blind holes or undercuts present on the items being treated. Medium to large production quantity cleaning systems for complex mechanical parts. The items to be treated can be placed directly onto the conveyor system either automatically or manually. The parts go along the table step by step, passing through the various stages of treatment. The cleaning process is designed according to client’s requirements, such as with systems where a higher quality surface treatment is required. Rotating table cleaning systems have the advantage of a step-by-step mechanism which allows the cleaning of even particularly complex mechanical parts. During the pause between steps a calibrated cleaning through precision jets is possible, or the treatment station can be equipped with specific mobile parts, meaning even undercuts can be properly treated. 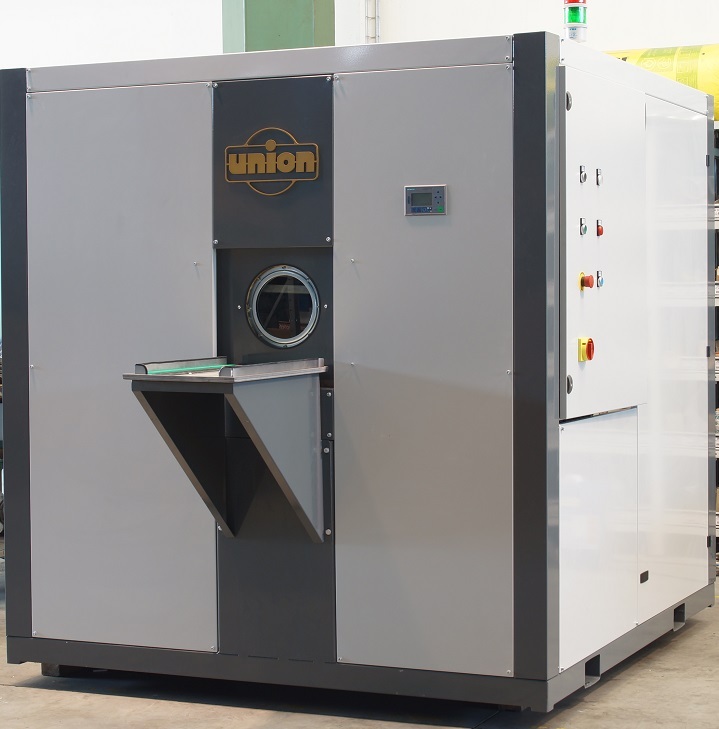 All the environmentally friendly cleaning processes manufactured by UNION S.p.A. are designed and built in-house by a specifically dedicated work group able to use to the full the technical experience acquired over the years in the various areas of the cleaning business. Union works as a development partner for all its customers, constantly providing innovative and reliable technical solutions. The production includes treatment plants using the Archimedean screw tunnel, linear step tunnel (IN & OUT), or round tunnel with one single loading and unloading point, rotary table, hydrokinetic vacuum flushing machine, degreasing cabin with movable spray ramps, etc. 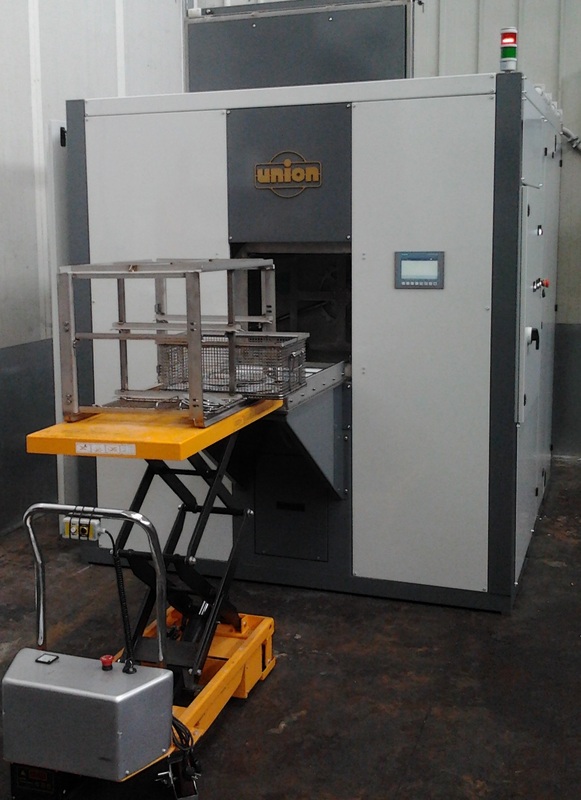 All systems can be equipped with an automatic loading and unloading device. SM series axial rotating basket equipment is made entirely out of stainless steel and can be used for treating parts of small dimensions. The equipment is easy to install and does not require any particular maintenance procedures. The single chamber base tank is separate from the cleaning area, thereby limiting the presence of vapour inside. Rotation is carried out by means of gear-motor mounted directly onto the basket support shaft, which can be easily removed in all versions. The spray cleaning is done by a hot water circuit with biodegradable detergents. Standard:AISI 304 construction, safety float, mechanical rotation, control panel with safety switches, removable residue filter, adjustable cleaning nozzle, electrical heating elements with thermostat, basket flush to edges. 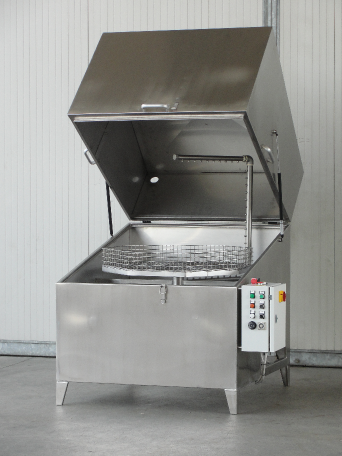 Available options: disc oil separator, compressed air jet, thermal isolation, auxiliary waste water pump, sack filter, external mobile trolley, manual cleaning sleeves with inspection window, side channel air jet by ventilator, double tank (cleaning rinsing), automatic opening for robot loading.